On the runway of fashion blogging there is a plethora of coverage for the ladies, but few sites dedicated strictly to men’s style. Helping to fill that void is Chris Law, who runs Fresher Than Chris. From his base of operations in Brooklyn, NY, the 29 year-old offers fashion coverage and education for plus-sized men, those on a budget and those seeking a medium ground between jeggings-tight pants and overly-urban Timberlands. 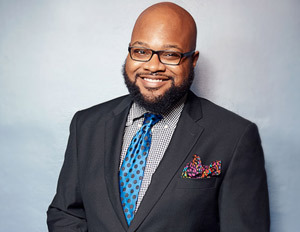 Thus far Law’s sartorial advice has won him recognition as a finalist for Best Style and Fashion Blog by the 2009 Black Weblog Awards and a feature in the February 2012 issue of Ebony magazine. Now, Law, who’s looking to add interactive elements to his site and launch a clothing line in 2013, shares his style, blogging and business insights as part of BlackEnterprise.com‘s Black Blogger Month. I love men’s fashion and wanted a platform to discuss menswear for all. I wanted to teach men how to dress better and present fashion and style to them in a way that didn’t make them feel uncomfortable. Tom Ford and June Ambrose. Although they are not bloggers, I respect their talent, their drive and their consistency. They’ve also perfected the art of using one lane to get them to many other lanes; be it Tom Ford, who started in design and that has expanded to writer and director. Those qualities help you to be a better blogger and are the reasons I’ve done well to date. Â For blogging, while I respect and am a fan of a lot of blogs, my influence in terms of blogging is the general public. I’m not just taking pictures of myself in cool clothes in SoHo streets. I’m providing true education through fashion editorials, with designer spotlights and so forth. Taking a job I wasn’t passionate about. It was styling an up-and-coming hip-hop group. I can’t fake the fresh. I didn’t believe in the project and thus my styling wasn’t the best. The financial payout wasn’t worth it. I do my best work for things I believe in. Align yourself with projects that you can be proud of, not projects that pay a certain amount. A strong sense of style that catches your eye and is worth talking about in a good way.Â Fresh is about putting your best foot forward and always presenting yourself in the best light. I read in Black Enterprise that The YBF.com creator [Natasha Eubanks] was making at least $1 million a year. It’s not who you know, it’s who knows you. Networking is important because business is all about relationships.